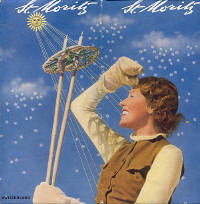 Travel brochure "St. Moritz," 1937. Photo-montages, design and text by Walter Herdeg and Walter Amstutz. Front view. This is the brochure of the advertise-ment depicted here. 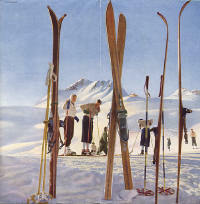 Travel brochure "St. Moritz," 1937. Photo-montages, design and text by Walter Herdeg and Walter Amstutz. Back view. Travel brochure "La Suisse Pays de Vacances," 1939. Design and photomontages by Herbert Matter. Published by the Swiss Tourist Bureau. Front cover. Travel brochure "La Suisse Pays de Vacances," 1939. Design and photo-montages by Herbert Matter. Published by the Swiss Tourist Bureau. Back cover. 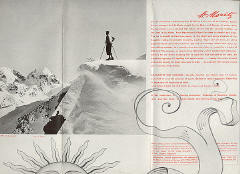 Snapshot of inside view of brochure "St. Moritz," 1937. The brochure opens into a huge mini-poster. Click the picture for the Full View. Photomontages, design and text by Walter Herdeg and Walter Amstutz. Travel brochure "50 Jahre Gotthard," 1932. Published by Pulizi-tätsdienst S.B.B. Unsigned, printed by "Roto-Sadag, Réunis, Genève." Travel brochure "Champéry - Suisse," circa 1935. Unsigned, printed by "Roto-Sadag, Réunis, Genève." Front cover. Travel brochure "Champéry - Suisse," circa 1935. Unsigned, printed by "Roto-Sadag, Réunis, Genève." Back cover.